You might not have noticed it, but today marks a very special anniversary on the London Underground – it is the 50th anniversary of the travelator at Bank tube station. This, not just the first moving walkway on the London Underground, but the very first one installed anywhere in Europe, was ceremonially opened to the public on 27th September 1960. The station itself had been open since August 1898 and at the time the only exit was a sloping corridor after plans for lifts to the surface were abandoned due to the cost of buying the building to house the lift equipment and ticket hall. Due to the unpopularity of the sloping corridor – a problem that also bedevilled a sloping corridor in the early Embankment station – plans were drawn up in 1903 for two quite narrow “travelling footways” or a single wide “travelling footway”, which would reverse direction each day for the rush hour. For some reason, this plan was never carried out – although had it been so, it would have been the world’s first commercial use of the technology. While the concept for a moving walkway had been around for about ten years when London Underground first looked at the idea, the first commercial deployment wouldn’t take place until 1954, when one was installed in a train station in New Jersey. 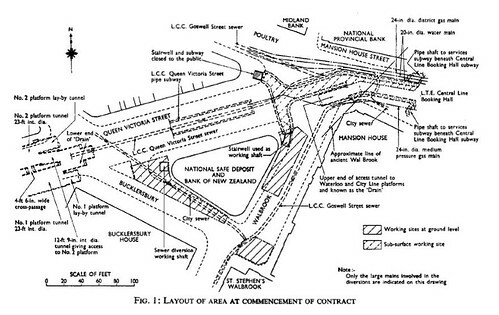 In 1937, plans were again drawn up to fix the problem of access to the railway – this time scrapping the entire tunnel and replacing it with conventional escalators in a new tunnel and a new ticket hall. As you might have guessed from the date – the war got in the way and the plans were abandoned. Following the war the plans were revisited in 1955 due to increasing passenger traffic, but were found to be too expensive in the then economic situation. It was now that the Trav-O-Lator scheme was looked at again. The new scheme as it was finally approved, involved a new ticket hall, and the installation of two moving walkways in a new 16ft 6″ wide tunnel running down to platform 2, along with a circulating area and new cut-outs improving access to platform 1. 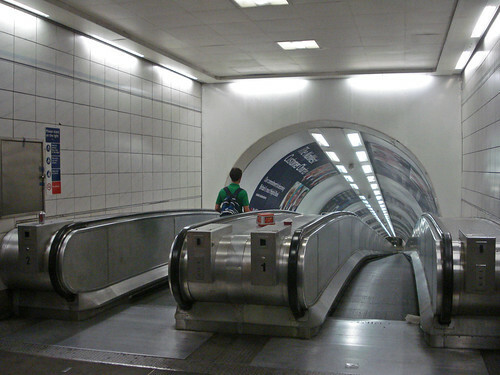 The original sloping tunnel – now fitted out with a series of steps to make walking easier remained in place, and still acts as the down route during the morning rush hour when both Trav-O-Lator’s are used for exits. 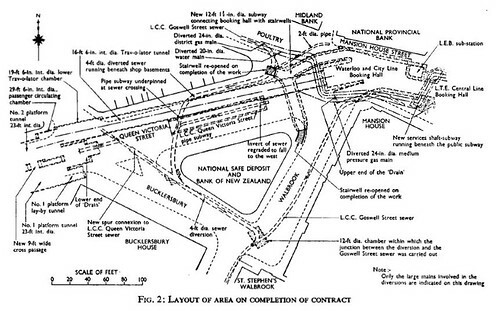 Construction of the new Trav-O-Lator tunnel was complicated by a considerable number of sewers and facilities in the area. In addition to the need to move the sewers, construction was also hampered by the quite close proximity of the new tunnel to the Central Line railway tunnels running just underneath. As it happened, construction on the tunnel started before a main sewer could be moved, so the some of the soil that was dug out – by hand – was dumped in the train overflow tunnel that ran past platform 2. Incidentally, a new pedestrian tunnel built from the ticket hall to the new entrance in Poultry reused the tunnel linings that were removed from that “overflow tunnel” as it was back-filed with soil. Even more weirdly – that same tunnel was itself built in 1900 in part by reusing an earlier tunnel built for pedestrians getting to the Central Line. There’s lots of heritage in that short 250ft length of tunnel. Work on the sloping tunnel – which I mentioned was dug entirely by hand – was carried out continuously from Monday to Saturday overnight in 12 hour shifts, construction of one ring of Trav-O-Lator tunnel, enlarged from the pilot tunnel, taking about fourteen hours. During the construction, they also came across a large number of substantial wooden piles. It is thought that these could have been related to a Roman villa that was discovered some 19ft down during the much earlier construction of Queen Victoria Street. Construction started in June 1957, but was slowed to a near standstill in December due to an economic crisis. Work resumed the following August and finally finished two years later. Note: the moving walkway, although nicknamed a travelator, is officially called a Trav-O-Lator, which is a registered brandname owned by the Otis Elevator company, and it is their model that was installed in the Bank tunnels. Although the moving walkways installed originally were supplied by Otis, and could be rightly called travolators, the title can no long be used as they were replaced between 2000-2002 with units supplied by Construction Industrielle de la Mediterrannee (CNIM). So, from now on, you can’t called them travolators, because that would be naughty. So this is in fact the 50th anniversary of moving walkways on the Underground, even if the original guests are no longer around. Wasn’t it actually installed by British Rail(ways), as they ran the W&C until privatisation? I’ve always been fascinated by the W&C because it’s such an odd little line – probably because of its history of being separate from the Tube network – the travolator’s part of its charm. It could be argued that as it was installed by Southern Railways, it isn’t the 50th anniversary of the thing we shouldn’t call the travolator on the Underground, but it is part of the Underground now, so I think some artistic license can be allowed. But the sign on the ceiling still calls it a travOlator. The spelling has al;ways looked wrong to me – good to know it is a brand name. A moving walkway was installed at the Paris Exposition of 1900. There is archive film on YouTube. LOVE your nerdy website. The ‘escalator link’ used to be *on* the tube map. Back in the 70s when as a kid who’d never been to London I was given every year a pocket diary – with the pencil in the spine and the tube map in the back, I was mildly fascinated by this. With a similar vagueness, I’d wondered why the escalator link wasn’t on the map anymore. This is the best account I’ve seen about the Bank Travelator even better than Wikipedia. I’ve just been watching a British Transport Films archive DVD that has an account of the building and opening of the Bank Travelator and I didn’t know if the system still existed today as it’s many years since I was in London. So thank you for filling in the lost detail for me. Sorry this comment is 8 years late! 1 Pings/Trackbacks for "50th anniversary of Bank Station’s travolator"